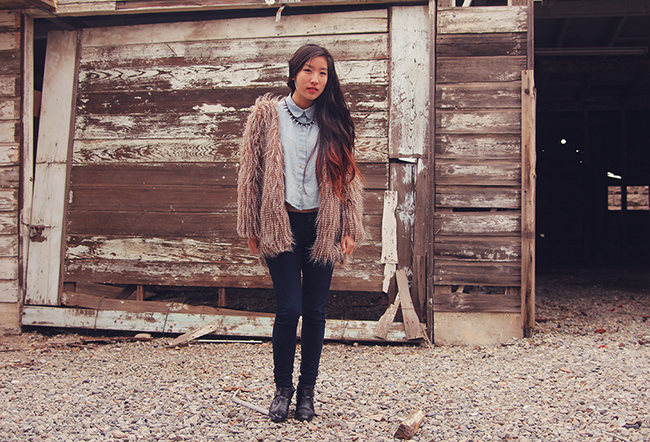 (spoiled Angeleno) but faux fur manages to resolve the winter blues. a ghostly railroad too terrifically sketchy to pass by. 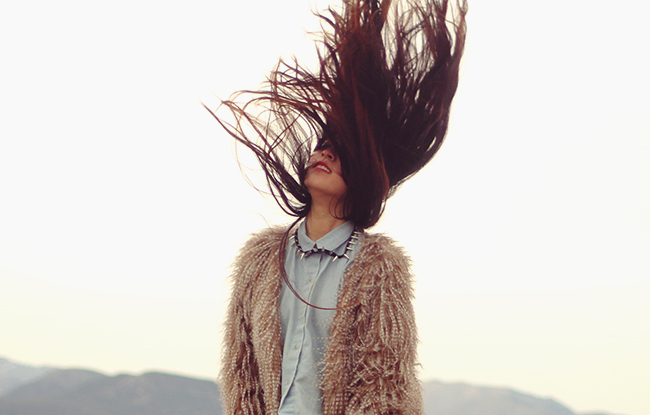 And of course, a hair flip shot is a must. Love that coat, gorgeous pics here girl! such great photos! love them. and your coat. fluffy deliciousness. Love your coat and your outfit! This pictures are so amazing! Nice job, the outfit fits perfectly the background, everything its in its right place! Stunning! And so amazing photography! Love! omg i loooooove all of these photos! You look AMAZEBALLS in all of them! Also, i love your hair! I'm in the process of growing mine out, and for some reason, i promised myself i wouldn't cut it for a whole year, so now i have to wait until may to cut my hair. Oh you look amazing! You're rocking that coat I love it! I love your coat ,amazing pictures! That jacket is incredible. I adore the textured look of the fur. The spiked headband looks great as a necklace!! Hi all the way from Australia! Wow....these photos are every bit editorial material. You look fantastic in this coat! Follow me back, would be great so we casn stay in touch! Let me know and big kisses! Beautiful pictures! I love that jacket! wow these photos are completely stunning! seriously, they look like they belong in a magazine or something! you look amazing! Love this entire look and the photos! 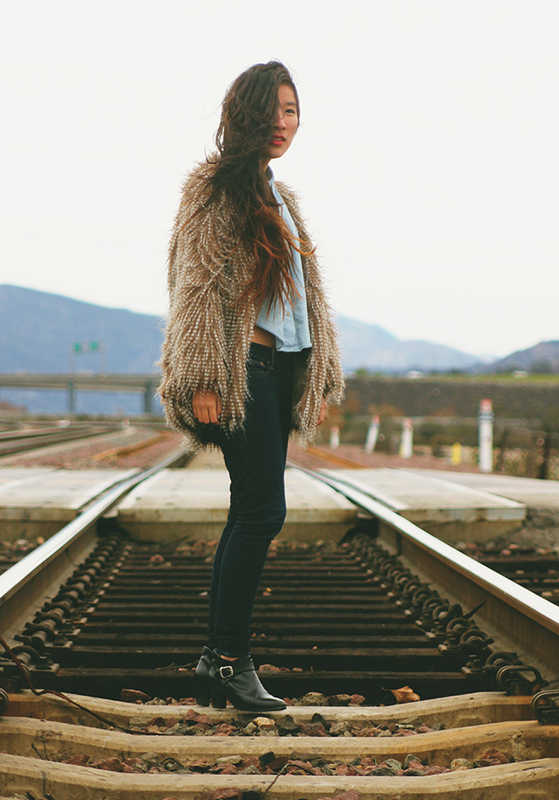 I love this fur jacket, you look amazing! that jacket is absolutely FAB! seriously, wish I had one in my closet right now! Beautiful pictures and the location wow!! oh my god, i literally gasped when i saw this. this looks like something out of a magazine! i'm totally astounded. and that coat is FAB. i want one! Ahhhhhh!! I love this. (: The jacket is amazing! Amazing look! Probably one of my favorites! Love that jacket! It looks amazing on you! Love your coat, you look amazing!! I love this photoshoot!!!! Everything looks awesome! Wow the photos are amazing~! I love the coat! ^^ Would you like to follow each other? You look absolutely amazing! The photos are beautiful! Stunning photos and that coat is incredible! Your hair is beautiful, I love it! your photos are so cool !!! loved the fur coat ! Coolest hair flip shot ever! :) lol. You look great. LOVE, LOVE, LOVE! the coat. THAT COAT IS JUST TOO COOL, i LOOK THE TOP!! OMG these pictures are absolutely to die for!!!! LOVE LOVE LOVE! Are you on instagram?